CannibalRabbit comes across some bizarre things in a days surfing, that’s for sure. But a website devoted to images of animals that are begging to be consumed is definitely something that needs to be publicised. 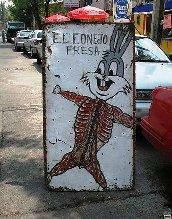 The image of Bugs Bunny, offering us his tasty flesh, pretty much guaranteed it’s inclusion here. Once someone points out to you how disturbing this is you may start to questioning the things that you have been accepting without a second thought. The website has plenty to explore; pigs made from a deli ham and much, much more at the suicide food website [^].